What: It is FANchise Bowl IV as the Screaming Eagles face Colorado for the final time this season. When: Friday, May 12 at 6 p.m. (PST). National Media: Stream - YouTube; Twitch-dot-com. Season Results: Feb. 26 - Screaming Eagles 42, Crush 41 (OT). March 31 - Crush 52, Screaming Eagles 49. May 8 - Screaming Eagles 64, Crush 41. Note: These teams will have played twice in five days. The Crush are 2-8 overall, 2-4 on the road and 1-7 in Intense Conference play. Colorado is coming off a 64-41 home loss to the Screaming Eagles on May 8. They are averaging 37.9 points per game and are allowing 54.7 points per game. The Crush are fifth in the Intense Conference. The Screaming Eagles are 2-8 overall, 0-4 on the road and 2-7 in Intense Conference play. Salt Lake is coming off a 64-41 road win over the Crush on May 8. They are averaging 42.5 points per game and are allowing 49.8 points per game. The Screaming Eagles are fourth in the Intense Conference. On Monday night, the Crush surely had other plans. The Screaming Eagles were opportunistic in all three facets of the game as they emerged with the 64-41 win. It was the second win over the Crush by the Screaming Eagles in Colorado this season. The Crush allowed the Screaming Eagles' to score a season-high 64 points. Offensively, Colorado did about everything it could. However, they turned the ball over three times, missed a field goal and were stopped on downs once. In other words, they were stymied to the point where they never fully got going on offense. The game was not really as close as the final score would indicate. It was made a bit more respectable by Daniel Lindsey's 42-yard kickoff return with 22 seconds left; It was Lindsey's second kickoff return touchdown of the season. Sean Goldrich returned to his starting role at quarterback for the Crush. He hadn't started a game in over a month, due to injury. In his stead, Liam Nadler had filled in and appeared to be the guy going forward. Just a week after Nadler was named IFL Offensive Player of the Week for leading the Crush over the Nighthawks, he was largely ineffective against the Barnstormers. That prompted new head coach Marvin Jones to re-insert Goldrich into the lineup as the starter. Goldrich completed 12 of his 19 attempts for 144 yards, four touchdowns and an interception. It was a pretty honorable performance given how the defense of the Screaming Eagles was circling around him all night. Barring something unforeseen, expect Goldrich to get the nod in this game, but with possibly a short leash. Josh Ford ran eight times for 30 yards in the game; He leads the team on the season with 276 yards on 67 carries, and also has three touchdowns on the ground. The problem for the Crush is that they lack a true two-dimensional look on offense. Ford, did most of his rushing damage in the first half, is averaging less than seven carries per game. With a 3.8 yards per carry average (at least decent by IFL standards). Lovie Rose III, who also did most of his damage in the first have, finished the game with six grabs for 75 yards and a touchdown. Kyle Kaiser had a quiet night, albeit with a touchdown catch on his lone catch of eight yards. Kaiser still leads the team with 37 receptions for 488 yards and 13 scores. Chris Gant, who caught a pair of touchdowns on Monday night, has 21 receptions for 237 yards and seven touchdowns. Defensively, Derrick Morgan and Cardelro Jones are the clear leader with 48 and 43.5 tackles, respectively. Each also has an interception. Ace Clark may be emerging as the team's best defender, recording 38 tackles and a team-leading 2.5 sacks in just six games. Antonio Marsall has 40.5 tackles on the season, and Lindsey has 31.0 tackles and an interception. The keys to win, as with last week, will be for the Crush defense to creat some defensive plays, and will need to utilize Ford in the running game to keep the Screaming Eagles' defense off guard. If only the Screaming Eagles could play all 16 of their games in Loveland, Colorado. The Screaming Eagles got a much needed win on May 8 and it was well deserved. It's the first time this season they were able to put everything together. Their second win of the season came against the same team which they beat in their first game of the season, and on that team's home field. Despite the IFL's fast-paced format, Salt Lake basically put the game away by halftime as they outscored the Crush 27-7 in the second quarter to take a 42-17 lead at the break (the Screaming Eagles' 42 first half point equal the game total in their one-point win over the Crush in week two). The Screaming Eagles scored in nearly every way possible, with the exception of a rouge (see the Extra at the bottom of this preview for more on that). There were three touchdown passes (by two different quarterbacks), four touchdown runs, a fumble return for a touchdown, a kickoff return for a touchdown and a field goal. Five Screaming Eagles players found the end zone and Salt Lake recorded their highest point total of the season. If they can build some momentum, they could see the number in the win column of the standings rise. They beat the Crush by 23 points, and could beat several other teams with the performance which was seen in this game. But, the Crush will be looking for revenge. They got it the first time after falling to the Screaming Eagles (in week 2) with their 52-49 in week 7. The Crush could be primed to catch the Screaming Eagles off guard in what will be the final game of this rivalry. Of course, the Screaming Eagles will be focused on obtaining their first home win over the season. The Cedar Rapids Titans are the only other team to not have recorded a home win this season. Verlon Reed, who is a mid-season candidate for Offensive Rookie of the Year, is the clear leader of this offense. He is second in the IFL with 166.6 passing yards and 35 touchdowns per game. Reed is tied with Sioux Falls Storm quarterback in rushing yards per game at 48.4 yards per game. He also has 11 rushing touchdowns on the season. Reed won IFL Offensive Player of the Week honors for his heroic role in the Screaming Eagles win over the Crush in week 2. As Reed goes, so goes the Screaming Eagles offense. James "Bubba" Poole is a welcome addition in the backfield. In three games, he has 20 carries for 43 yards and three touchdowns. Devin Mahina, who had a strong game last weekend against the Crush, leads the team in every receiving category. The return of Juwan Dotson has had a positive impact for the Screaming Eagles. In his seven appearances, he has 34 receptions for 247 yards and six touchdowns. Chris Robinson has provided a jolt to the team in just his first two games with the Screaming Eagles. He has four receptions for 27 yards and a touchdown. 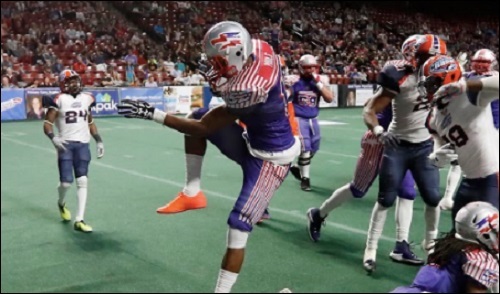 Robinson also leads the team in kickoff return average at 24.4 and has a kickoff return touchdown, which he scored in last weekend's win over the Crush. 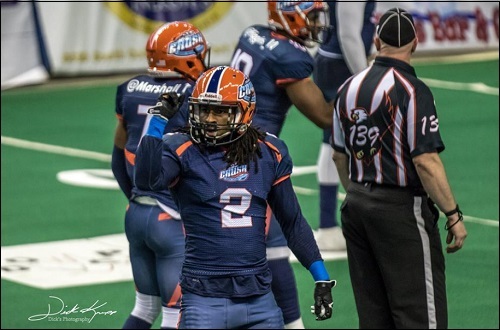 James Calhoun, who has appeared in all three facets of the game for the Screaming Eagles over the course of the season, was named IFL Defensive Player of the Week for his eight-tackle, three interception performance two weeks ago in Salt Lake's 31-29 win over Spokane Empire. Calhoun splits time in the return game and has shown up on the offensive side of the ball. Jerome McElroy has 2.5 sacks in just two games with the team. Ed Burns has 32 total tackles and an interception, and Rashad Greene has 27 total tackles and an interception of his own. To win, it's simple: The Screaming Eagles need to duplicate their performance from just five days prior. They need to be hungry, and create and take advantage of any turnovers and untimely penalties committed by the Crush. May 12 - *Arizona Rattlers (6-4) at Spokane Empire (7-3), 7 p.m.
May 13 - *Cedar Rapids Titans (1-10) at Iowa Barnstormers (8-2), 5:05 p.m.
May 13 - *Sioux Falls Storm (9-1) at Green Bay Blizzard (2-9), 5:05 p.m.
On May 8 when the Screaming Eagles visited the Crush, the Screaming Eagles scored 42 points in the first half. Their season high in scoring came in a 73-60 loss to the Arizona Rattlers in West Valley City, Utah. Previous to that game, they had not scored more than 49 points (ironically, that was in a loss to the Crush in week 7). I wonder why they cancelled the fan called plays for the Crush and yet the Screaming Eagles still have it. Because, by design, the Screaming Eagles were going to work that way from the beginning and then the Crush would join later. Due to the late start to the organization for the Crush they were given more time. After the WSJ story broke it was evident that this was not going to be the way the Crush would work next season (if there is one) so the decision was made to not do it. According to all the original plans, the big game was supposed to be the last one that they just played, but apparently someone changed that plan...without telling anyone else. I actually was positive towards the people running FANchise to start the season, but the more and more they drag down the Crush, the less and less I like them. I have been reading about that, and there have been discussions on the futures of the Crush and the Screaming Eagles. As Angi and I construct the previews for each of the teams, we collectively decided not to include the prospect of fans calling plays for the Crush in the previews (and Angi is not including it in her game recaps). If, in some instance, there is evidence of fans being able to call plays for the Crush in addition to the Screaming Eagles, we will revisit that. All that said, thanks for looking into that and letting us know what you found! Personally, once we learned of the Crush being put up for sale, I figured the fan play calling would be a no-go. So the Crush have been put up for sale officially? Not the best choice of my words. It is a distinct possibility. We are working on a few angles and that possibility is one of them. My feeling is that the team is for sale, but I cannot say officially whether that is the case. Oh, ok. Looking forward to seeing you and DT's report. SCtoC Programming Note: Heidi and I will work this thread the whole game. At 7 Pacific, Julie will be working the Empire-Rattlers thread, and I will pop in there as well. At the conclusion of this game, Heidi and I will pop over to the other game to help Julie finish it out. The recaps for both games will be written at the conclusion of the Empire-Rattlers game. I'll be popping into both threads as well. Awesome! We have four hours of football ahead of us; double duty for two! Hope both games are worth watching as 1 good IFL game is special let alone 2. Kickoff is coming up. The Screaming Eagles are gearing up for the game on twitch. I'm hoping it will be on youtube as well, but I doubt it since the last two Screaming Eagles home games have been on twitch. Pre-show is on right now. Not really watching it though, as I'm waiting for kickoff.